Click on the small pictures to see full-size image. We are near Wellington, the capital of New Zealand. We have a temperate maritime climate, similar to a cool Mediterranean type. The summers are warm (21-22oC) and dry, the winters cool (11-12oC) and wet. 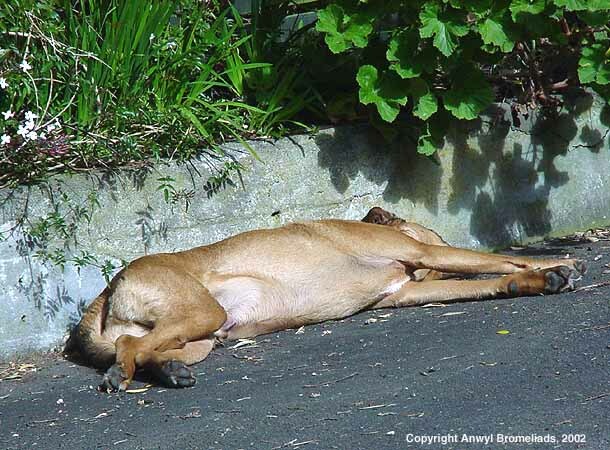 Minimum night temperatures are generally 10-12oC in summer and 3-5oC in winter. Our nursery is about one kilometer from the sea, about 300 meters up, and surrounded by trees. We get three or four mild frosts per year, when the temperature in our unheated shade-houses can drop to zero or, at most, minus two Celsius. 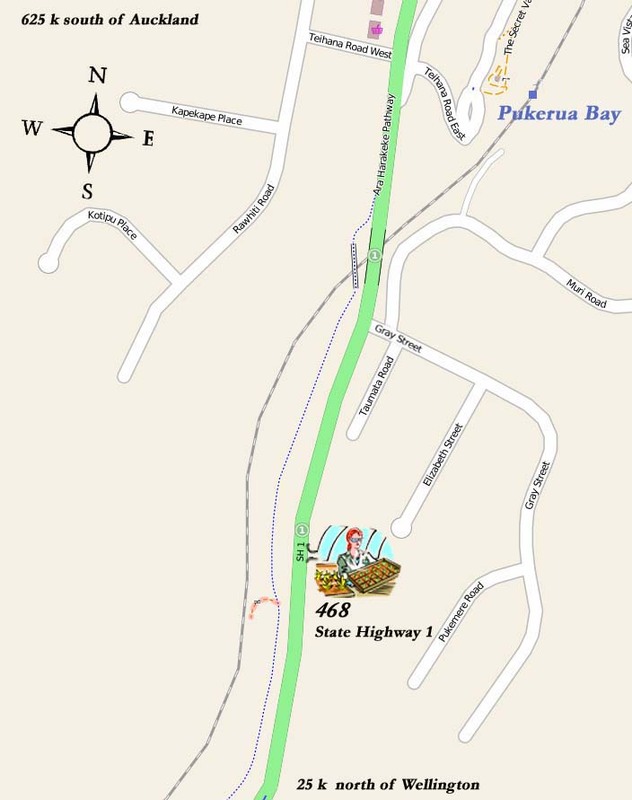 The nursery is on State Highway One, No. 468, 25 k north of Wellington. Most of our tillandsias are grown from seed, and start life in an incubator in our "laboratory" (a small room next to the office). The incubator has fluorescent lights (cool white) operated on a timer that turns them on for 14 hours per day. There are two thermostats, alternated by the timer so that a night temperature minimum is activated when the lights switch off, and a day temperature minimum when the lights switch on again. Tillandsia seeds are sown on pieces of fiberglass mesh (shadecloth works just as well) hung up close to the lights. A tray of sand on the bottom is kept wet, and has a soil-heating cable in it. Seeds sown on compost are germinated in trays suspended above the sand. 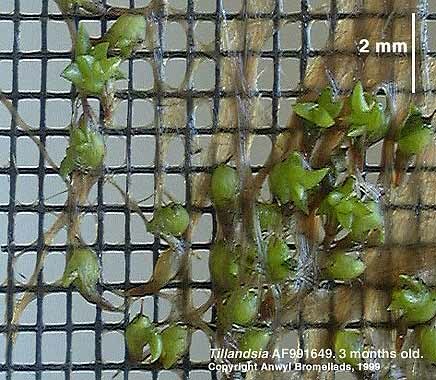 The tillandsia seed are placed on the mesh, and sprayed with a fungicide solution (Benlate or Chinosol) which enables them to stick to the mesh, and they are then misted three times per day until they are moved out to the growing-on house. Seedlings stay in the incubator for 2 to 9 months depending on their growth rate and the time of year they were started. 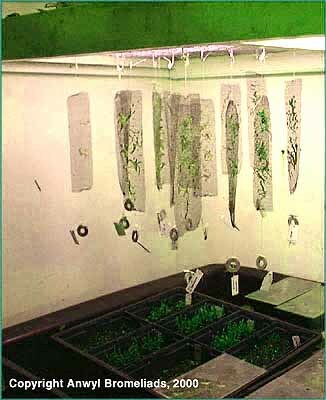 Seedlings are normally taken out when they have 2 or 3 juvenile leaves. 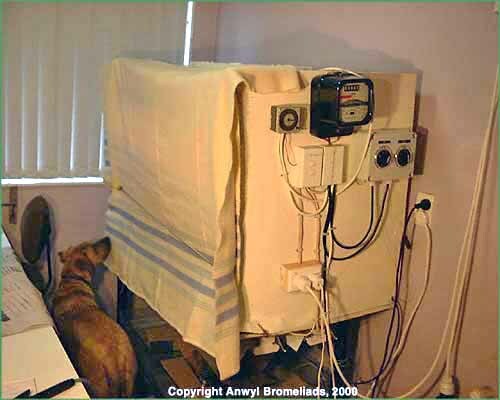 The growing on house has an inflated twin skin plastic covering and automated heating and ventilation. 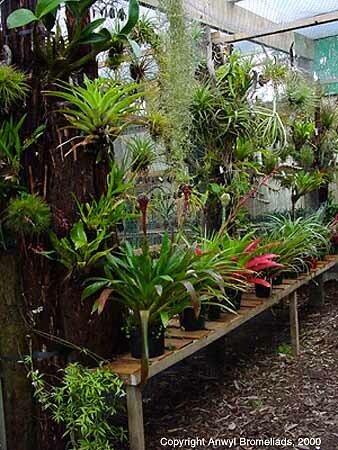 Down the right-hand side is a heavy bench where the tillandsias on community mounts are hung), and tray-grown plants sit underneath. On the other side there are a series of vertical screens covered in wire netting on which tillandsias transplanted onto single mounts are hung. Tillandsias are moved in from the incubator and left on the mesh seed-beds until they are ready to transplant onto community sticks. When the seedlings start to crowd on the community sticks, or have grown large enough they are moved to individual mounts and hung on the wire-netting screens. Watering is done manually because the seedlings need more water than older plants in the same house. Our shadehouses are basically a clear fiberglass panel roof with shadecloth or windbreak netting around the walls. This enables us to keep the plants dry during cold weather, and allows plenty of air circulation so the air round the plants does not get too dry. 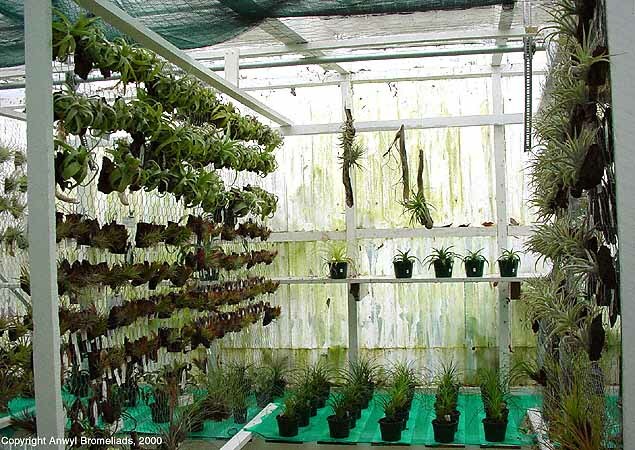 The Tillandsia seedlings are normally moved from the growing-on house out to a shadehouse as soon as they start developing adult-form leaves. 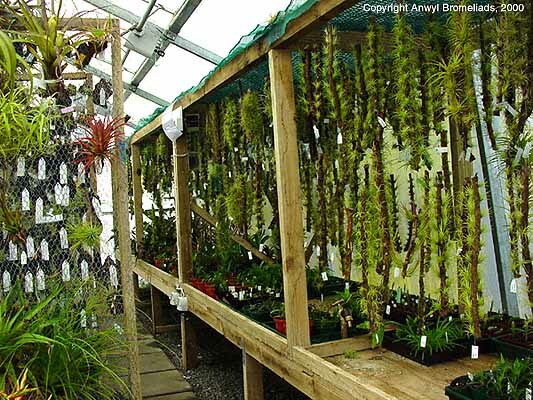 Imported tillandsias are quarantined in a multi-layered level-2 facility at the nursery.